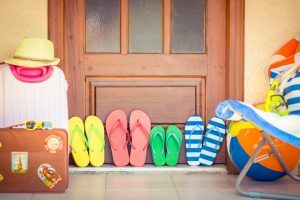 Summer is usually one of the slower times of the year for property sales, and while the kids being off school and people jetting off on hols gets in the way a bit, you shouldn’t give up on a summer sale. The warmer weather means you can bring the entire property into play – from the loft to the bottom of the garden. Open all the windows and curtains, mow the lawn, eliminate any dark, dusty corners and invest in a deep clean. It’s all about the kerb appeal. The frontage is the first thing viewers see, so make sure they’re drawn in. If you have a front garden, tidy it up, plant some rapid-growing flowers, fix the trellis, stash the rusty old trike and maybe even returf it. All outdoor spaces work best in summer, so make your back garden all things to all people. Open up the space, keep the lawn trimmed and show older buyers how great a BBQ would be, or a young family how much space their children will have for a wendyhouse and trampoline. Pressure-wash the flagstones, freshen up old decking and repair that storm-damaged gazebo. If you’re not getting viewings, or the nibbles aren’t coming, look at what you could improve. Get some new photos done, look at your listing’s SEO – any estate agent worth its salt knows all about this – and see where your property is being viewed online the most. Summer is when you and most other people take their holidays, so not only are viewers away, but so are lots of vendors – including you. This doesn’t mean you have to shut up shop, though. Get the place as pristine as possible before you go and leave a spare key with the estate agent. Think about it – a week or two in the sun, no tidying and (hopefully) all the viewings that the less flexible vacationing vendors are missing out on!